This past weekend, I realized there’s a little thing I truly miss about living in a small town. You know the one. You’re driving down the road, get close to a car coming the other way, and see the driver’s hand pop up from the wheel giving a little wave. It’s a quick lift of the hand, a small gesture, but one that doesn’t exist in the big city. People don’t do The Wave here in Atlanta. In fact, just this morning, it hit me that people don’t even do the Thank You Wave here. You know, the one that’s flashed when you let somebody out in front of you? I let a man out in front of me at Starbucks and got nothing. Nada. No lift of the hand, no gesture of thanks. We moved from our small hometown a little over 4 years ago. Going back there now, we easily fall into the habit of throwing The Wave to people we pass, and they wave back! It’s a little thing, but it means so much. This has been my post for this week’s Just Write, hosted by the lovely and talented Heather from The Extraordinary Ordinary. All at once, all the things had to be done. Last day of work. First day of work. Taking the kid to Florida. Picking the kid up from Fort Valley. Everything happened all at once. It wasn’t planned like that — it is what it is. The dust is settling. We’re settling in the new house, making sure to take a minute to look out back at the calm body of water that’s feet from our back door. I’m settling in with my new job. I’ve been going into the office every day, but hope to get into the groove of working from home most all of the time starting next week. Henry will be home tomorrow after being gone for 12 days. On Friday, he’ll ride in the parade with his scout pack. The weekend will be spent catching up, unpacking, being together, and watching the dust settle even more around us in our new surroundings. He sits perfectly perfect, posture textbook worthy, with his work-issued STOP sign leaning next to him on the bench. His orange vest is clean and zipped, his hood pulled over his head, under his hard hat. He’s a DOT worker I pass every morning on my way to work. Without fail, he’s sitting on the bench at the intersection with a book in his hand. There’s normally a pen, frantically jotting down notes in the margins or underlining passages. Whatever it is he’s doing, he’s doing with intensity, not seeming to notice that he’s sitting five feet from one of the busiest streets in the area. This morning he had a small legal pad, again, frantically writing line after line on his lap. In my head, at that stoplight, I wonder what his story is. I mean, he’s a young guy. The options are endless. Today my thoughts flowed and my imagination went wild. He’s working a DOT job during the day and going to school at night. He’s been up with a crying baby because his girlfriend who delivered their first baby a few weeks ago had to return to work at nights. Running on about 90 minutes of sleep, he figures he can get his school assignments read and written while he’s waiting for the bus. It’s his few minutes of peace before he hits the pavement, holding the sign that switches from STOP to SLOW, allowing the long line of pissed off drivers through the construction zone where his coworkers are jackhammering, bulldozing, and standing around pondering the meaning of life. Work is noisy. Waiting for the bus is quiet. In fact, he loves getting immersed in the novels he’s been assigned at school. His European literature course is his favorite. He’s pondering changing his major from Business to Education. He feels himself being drawn to teaching kids about the power of literature and the power of writing. As he sees the bus coming down the road, he flips the legal pad to the back and catches a glimpse of the letter telling him he’s been chosen for a short story award at his college. The young man slips his book and notepad into the side of his lunch bag, grabs his STOP/SLOW sign, and gets on the bus. He smiles to himself knowing that if he can keep on going, working hard, and loving his family, he will never live his life on STOP or SLOW — he will live it on GO. 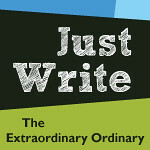 This is my installment for Just Write, hosted by Heather at The Extraordinary Ordinary.